How do you help your family declutter, keep reading to find out my top tips! There you are, you’re finally ready to let it go. Good for you! You are excited to roll up your sleeves and get to work. To clear out all the extra and get your home streamlined and organized. The only problem is your family is not on board. They just don’t see the clutter that you do and they see really no reason to get rid of anything let alone any of “their” things. And there you are. Completely stopped in your tracks before you have even gotten started. So what do you? 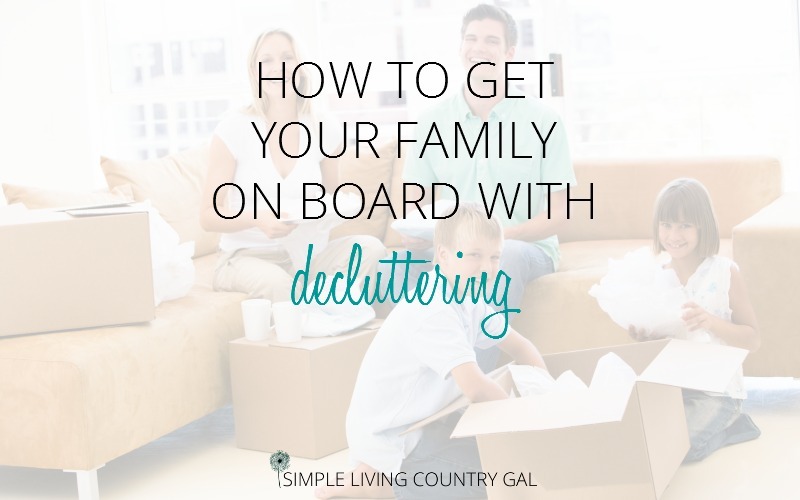 How do you convince your family that cutting the clutter is the right fit for all of them and the work will be worth it for everyone in the home? My Hubs has a hard time letting go of things. Cuz, ya just never know when you are going to need a stray piece of wire. I kid you not. He has more senseless collections of doohickies (why yes, that is a word) than any 80-year-old farmer. Our garage and barn is a mish-mash of unlabeled coffee cans that make me cringe whenever I see them. So decluttering “his” stuff was just not going to happen. Finally, I decided to lead by example. I have found that by decluttering “my” things and streamlining my rooms he is seeing just how nice it is to have a place for everything and everything in its place. When he sees just how cluttered his spaces are in comparison to mine. (The garage compared to the kitchen for example.) He is finally and all on his own beginning to pare down….just a bit. Last year I began totes for each of my boys for Christmas decorations. As I decorate for the season and come across an item I no longer love I will put it into one of my son’s totes. Just this past Christmas my one son asked for decorations and I grabbed his tote. Hubs was so impressed that I had such a thing all set up and ready to go that he began totes for each of the boys for tools. Maybe part of the problem, especially with younger children, is they simply do not know where to start. Give them my super simple tip for getting started with clutter. Get rid of the trash first. By taking a wastebasket and removing all the trash in a room you are showing them just how easy it is to remove the unneeded. After the wastebasket is full simply dump it out and ask them to now fill it with toys they no longer play with. By using a small container like a wastebasket you are keeping the decluttering simple and less scary. Whether you are dealing with a child or an adult, sometimes all they need is a good reason why. Explain to them why YOU want to declutter and how important it is to remove the mess and the stress that goes along with it. Looking for things that are lost in the rubble doesn’t only drive you crazy…it drives everyone crazy! Paint a scenario of a well-ordered room and how nice it is to find your favorite things when you want them and in the condition they should be in. Once your family truly understands your reasons, they may be more willing to chip in. If you create a system that has 10 steps you are simply not going to stick with it. The same is true, maybe even more so, with a reluctant family. Keep the job of decluttering simple and before you know it they will catch the bug too. So how do you make it simple and fun? Large bins with big bold labels for one. And not just any labels. 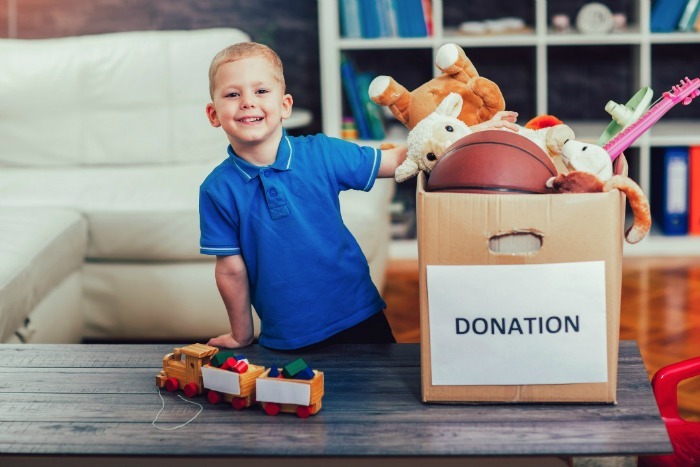 For the kids, you can put pictures of children on the tote explaining that by sharing their toys they no longer play with, they will be helping others who do not have as much as they do. You will be amazed at how much children love to help others if given the chance. Take a tip from my own Hubs and suggest to your spouse that you start totes for your children when they finally have homes of their own. If your spouse knows the “extras” are going to the family they may be more willing to let go. If you are like me you have this magical talent of being able to find things when they seem lost forever. If I had a nickel for every time I heard “mom do you know where my _____ is?” I would be a very rich woman. Instead of being the hero, try tossing the ball back into their court for a change. If you have older children this tip will work surprisingly well. If they can’t find it, let them learn the hard way. I can guarantee this lesson will not take long to learn. Yes, it is tough love…but sometimes those are the lessons that teach the most. My younger son could not find his cleats and was forced to sit the bench that game. Let me just say, he knew where his sports clothes were from that day forward. There is nothing wrong with a little bribery as long as it’s for the good of the family. (or at the very least…mom!) 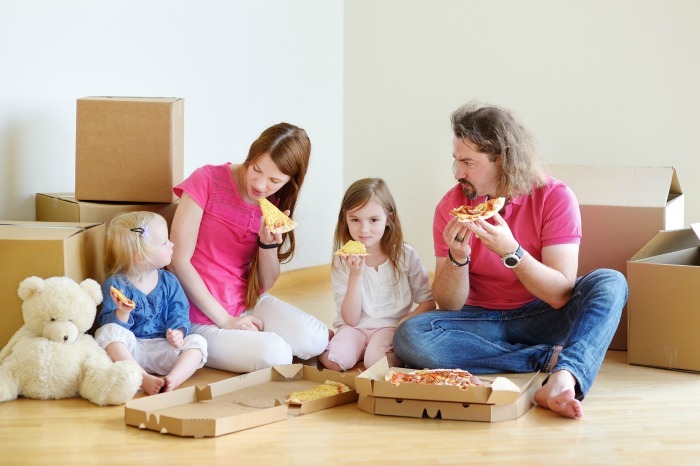 Offer the kids a night of pizza and bowling if they begin to declutter. Or you can simply lay down the law. Tell them nothing new comes in until something old goes out. This was my motto every December. If they did not clean out the toy box, then I would not allow anything new to come in. Maybe a little jail time? No matter how young or old your children are, this trick works wonders. Each night before you head off to bed, pick up any items from the kitchen or family room. Place them in a closet and lock the door. If your child asks for that item, they must post “bail” to get it back. It can be another item to purge or a task like sweeping the kitchen floor. Sometimes you simply need to get creative to get results. A little advice. Don’t try this tip on your spouse. I did and it totally backfired. It wasn’t long before my items ended up in jail. Eeek. Lesson learned. I now use this tip only on the kids…..just say’in. Just like I have a junk drawer, so must my family. By allowing them an area where they can just “let it go” you are taking off the all or nothing approach. The family will only resist if backed into a corner, so by giving them a place that can just be a mess, it will take some of the pressure off of you and them. Younger kids can have a toy box. Tweens can have a hope chest or lock box. Teens can have a desk drawer (or drawers if necessary). Hubs can have a cabinet in the garage or workshop. By allowing them this small space they will be more willing to clean up the rest. When you have a spouse that is simply not on board it can be hard to keep your own motivation up. To keep the peace and not lose sights of your own prize learn to give a little. Choose your non-negotiable space and allow him to have his. For me, it is my kitchen. I spend most of my time in there so it was important to me to have that space neat and tidy. For Hubs, it was his garage. That is his place and he wanted things his way. Oiy….those coffee cans! As you begin your decluttering journey let your family know why. Explain to them how the clutter makes you feel and why it is necessary for you to make a change. Pick your rooms and tell everyone that they will be organized and systemized from here on in. As your family sees the effect of a neat and well-ordered room has on you, they will naturally want to be a part of that. Before you know it other rooms will begin to take shape little by little. As with my Hubs, he was totally not on board with paring down. But as he saw our house change for the better and my attitude along with it he naturally began to make changes as well. Throughout all of your decluttering journey do not lose sight of your “why”. Take your own path and allow your family to follow along at their own pace. Before long you will see them take interest in what you are doing and the strides you have made. Order is absolutely contagious and when given the chance to want it just as much as we do, our families will be on board and eager to make changes too. Hahaha, cute ideas! We have gone through some serious downsizing when we sold everything and moved into a travel trailer with our family of 9, but even so I know that when we are back in a house this year that we will continue to have to practice the upkeep of simplicity and minimalism. Thanks for the reminders and tips! Holy moly Julie…..9???? Wow, that is amazing!! Great tips! I agree, it is contagious. Sometimes I won’t say anything and just my working can get others involved in helping. Plus, they feel so much better in that de-cluttered space. Thanks for sharing on the Homestead Blog Hop. I hope we see more this Wednesday.